A must-read for new users! Commands are simply pieces of text that tell the game what to do. The player.ResetHealth command, incase you hadn't already guessed, would set your character's health back to its maximum level. To execute commands, type them into the text box at the bottom of the console and hit the ENTER key. If that's all you needed to know, you might want to head over to our console commands list. If you still want to learn, there's a lot more information below! In Skyrim's console, you are unfortunately unable to scroll up and down using your mouse. You must use the PAGE UP and PAGE DOWN keys on your keyboard. These are usually located above your arrow keys. A target could be an object, NPC, item - anything in the game! In Skyrim, commands are often applied to a "target". A good example of a targeted command is the reset health command: this command will reset the health of your target. To select a target in Skyrim, all you have to do is click on your desired target whilst the console is open. Let's say you wanted to kill a guard, all you'd have to do is open up the console, click on the guard with your cursor, and then type the command kill into the console. To unselect a target, all you need to do is click the target with your cursor whilst the console is open again. If a target is selected, its reference ID will appear in brackets above the console - you can verify whether or not you've successfully unselected your target by checking to see if this is still visible. You can target your character with a command by typing player. before the command. 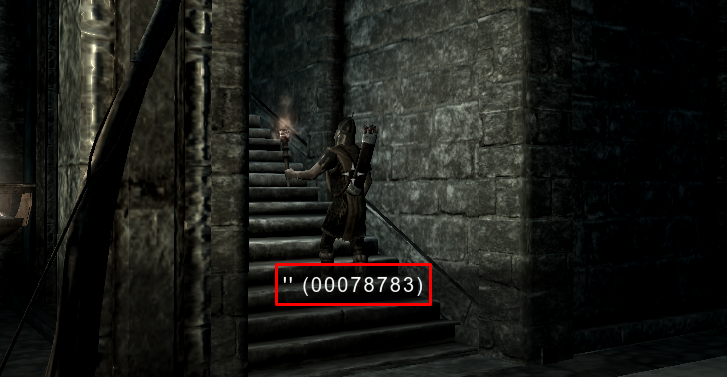 If you wanted to kill your character instead of a guard, you would type player.kill. What is a Reference ID? A reference ID is a unique ID that is assigned to every item, object and NPC in the game - and by every, we mean every. Whilst two Whiterun Guard's may have the same NPC ID, each individual guard will have their own reference ID. If you spawn two items, each item would have its own reference ID. Two of the exact same haybales may be in a barn, but each haybale has its own reference ID. You get the idea. Make sure you don't confuse reference IDs with base IDs (they're explained below). Base IDs are IDs assigned to a type of item, object, or NPC - two of the same object would have the same base ID, but each a different reference ID. What is a Base ID? A base ID is a short, unique code assigned to a type of item, NPC or object - it is not the same as a reference ID. Every Bear Pelt item in the game has a base ID of 0003AD52, Bear Claws a base ID of 0006BC02, Dear Pelt a base ID of 000CF89E, you get the idea. On our Skyrim cheats list, you will find the word "argument" being used a lot. An argument (when used in the context of console commands) is another word, or piece of data, that you add to a command. Arguments are separated by spaces in Skyrim. For example, in the command player.AddItem 000E94D4 1, the arguments are 000E94D4 and 1. Arguments aren't always necessary, sometimes they're optional. For example in the RemoveAllItems command, you can optionally specify a reference ID as an argument - if you do, the removed items would be put in the inventory of the NPC or container with the specified reference ID. If you don't specify an argument in the RemoveAllItems command, the items will be permanently deleted. That's all there is to this article. If you want to learn more about the Skyrim console, check out the guides on our blog. If you want to jump into the action and find commands to use, check out our command list. No need to wait to carry more weight! Learn how to spawn gold with console commands!